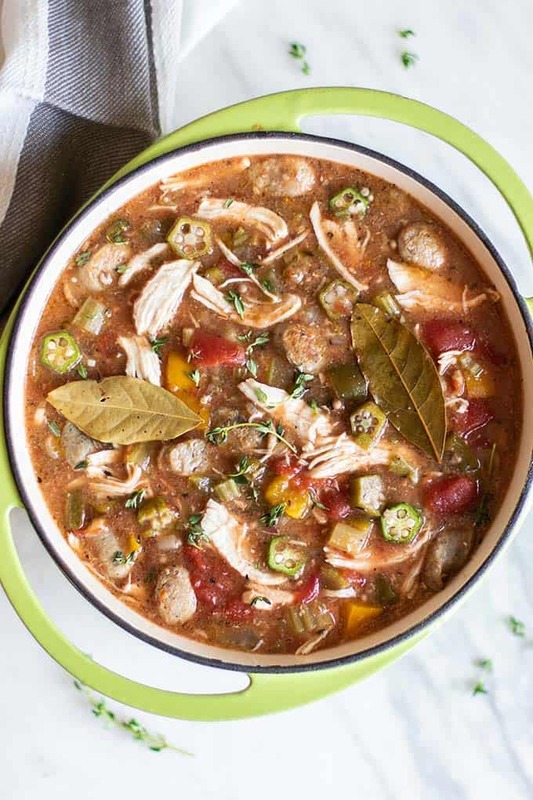 This easy method for making Crockpot Gumbo makes a delicious weeknight meal, and is freezer friendly! 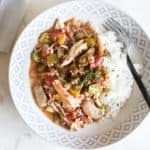 A cajun chicken stew made in a slow cooker with tons of creole spices and thickened with a gluten free roux. This post is sponsored by Jones Dairy Farm — aa company committed to bringing high quality breakfast meat options. I love that this company has healthier options, such as sugar free and nitrate free bacon, and antibiotic free and sugar free turkey and chicken sausage. I only work with brands whose products I genuinely love. Thank you for supporting the brands that help keep Sunkissed Kitchen running! 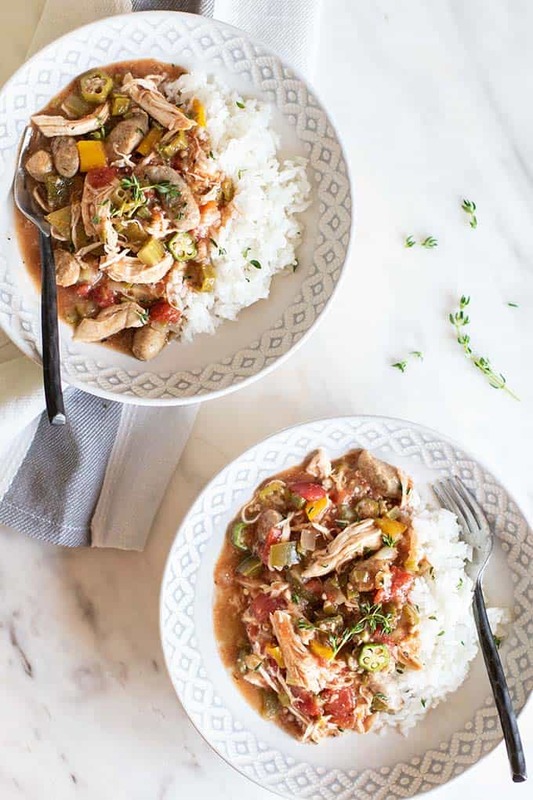 Gumbo is a cajun chicken and sausage stew, sometimes made with shrimp. The stew is made with a roux to thicken it (see below on how to make it!). Other necessary ingredients are onions, garlic and celery (characteristics of cajun cooking), and tomatoes and okra. This dish comes from the Louisiana in the American South. It is seasoned with thyme and cayenne pepper, and also with Gumbo File. Gumbo File is made from the powdered leaves of a sassafras tree. Another characteristic ingredient in gumbo is andouille sausage. This version uses my favorite frozen sausages from Jones Dairy Farm. I always have a selection of their products in my freezer because they are quality breakfast meats with no “junk” added — no preservatives or nitrates. These Pork Little Links are also sugar free. 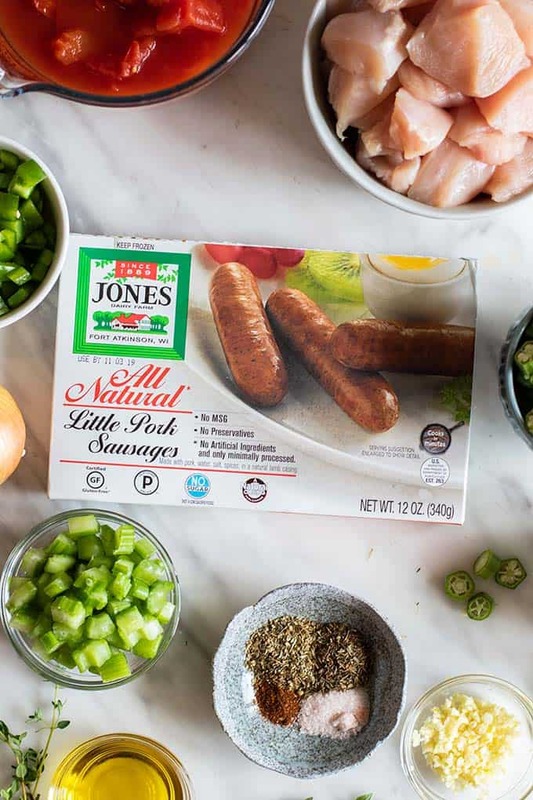 Jones Dairy Farm All Natural Little Pork Sausages are perfect in this gumbo recipe, and they add wonderful flavor! I love the way my kitchen smells when I have the sausage from Jones Dairy Farm cooking. The perfect spice mixes and the seasonings taste so fresh. Visit the product locator on the Jones Dairy Farm website to find their products at a store near you. Traditionally, Gumbo is made in a pot. The chicken is poached and shredded. A roux is made, and then the onions, garlic and celery and softened in the oil and flour mixture before adding the water, tomatoes, and spices. First, make a Roux by mixing flour and oil in a frying pan. Add the chopped onions, garlic and celery, and lightly fry. Next, add chicken, peppers, okra, tomatoes and spices to the crockpot, then add the roux/vegetable mixture, along with water. Add bay leaves and sausage, and then slow cook for 4 hours (or on high for 2 hours). Shred the chicken, and then add back into the pot. Add Gumbo File last to benefit the most from its unique flavor. For this version, I made a gluten free roux. If you are not looking to make this recipe gluten free, no problem! White flour works as well. 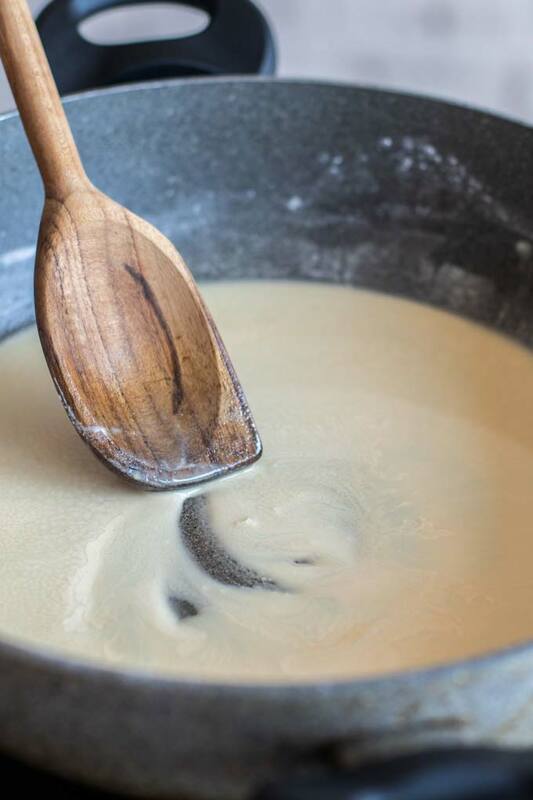 A roux is actually very easy to make. It’s made with a 1-1 ratio of clarified butter or oil, and flour. A gluten free roux is made with sweet rice flour. Bring the oil and flour together by stirring it over medium high heat until it toasts to a light brown color. Wheat flour toasts to different shades for different recipes — from a light white, to a blond, or a brown or dark brown color. Sweet rice flour does not get as dark. Cook the rice flour until it is a blond color. Wheat flour toasts to a dark shade adding more of the roux flavor throughout the stew. 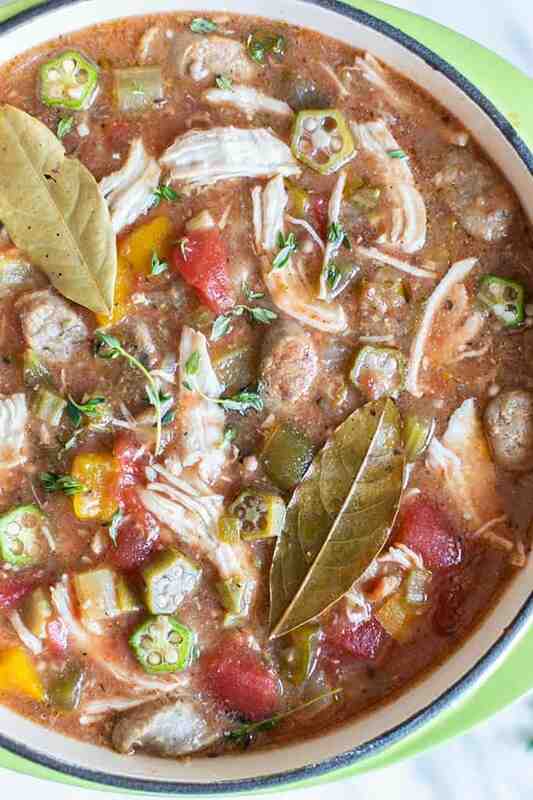 Gumbo is full of healthy ingredients and tons of flavor and spice. 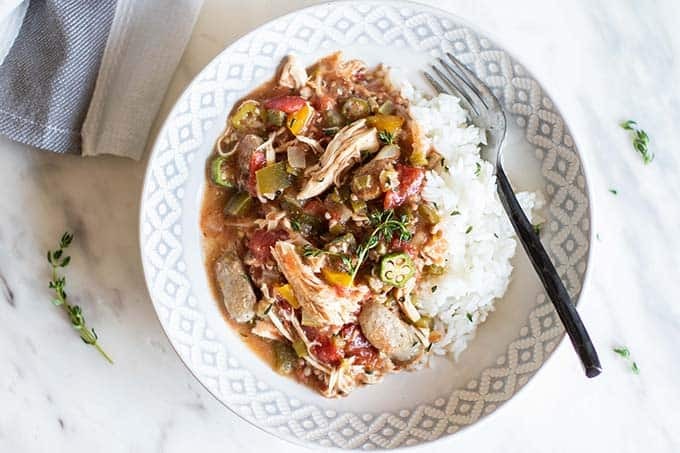 Serve this slow cooker gumbo over rice, or keep it lower in carbs by using cauliflower rice. I typically make mine less spicy, and then we add extra hot sauce to taste, since my son can’t handle the heat! Can I make this Paleo/Whole30? : I also tried this recipe without a roux, and used 1 can of tomato paste as a thickener. We loved it, but I felt like it wasn’t a traditional Gumbo so I used a gluten free roux for this recipe. Can I add Seafood? : You can definitely make this with shrimp as well! Shrimp will get very tough if you cook it as long as this dish cooks. When you’re ready to serve, brown shrimp in a frying pan on high heat with a little oil, and then add to the gumbo to absorb the flavors. Can I Freeze Leftovers? : Yes! I froze this gumbo recipe in meal prep containers and it reheats wonderfully. Add leftovers to single serve containers and store for up to 3 months frozen. Reheat in the microwave or on the stove top. 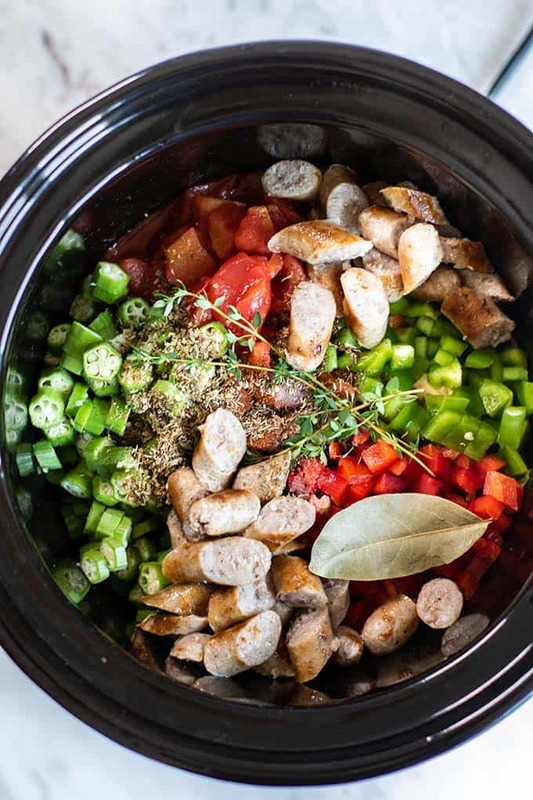 A spicy cajun chicken and sausage stew made easy in the crockpot. This recipe makes a large batch -- so freeze extras for quick meals later on! In a skillet over medium high heat, add oil and sweet rice flour. Stir, and allow the flour to toast. Continue to stir until the flour becomes a light brown color. Add the chopped onions, garlic and celery to the roux, and saute until softened. In a crockpot, add the chicken, tomatoes, water, bell peppers and okra, along with all the spices except the gumbo file. Add the roux/vegetable mixture to the crockpot, and then rinse skillet. Add the Jones Dairy Farm Pork Little Links to the frying pan, and fry until golden brown over medium high heat. Slice the cooked sausages, and add them to the crockpot. Slow cook the gumbo for 4 hours on low. It is best cooked on low, but can be made in 2-2 1/2 hours on high heat. Once the mixture is cooked, take the chicken breasts out, and shred them. Add the chicken back to the pot. Add the gumbo file, and stir it in. Connect with me on social media! Find me on Facebook or Instagram where I post daily healthy eating and lifestyle inspiration. 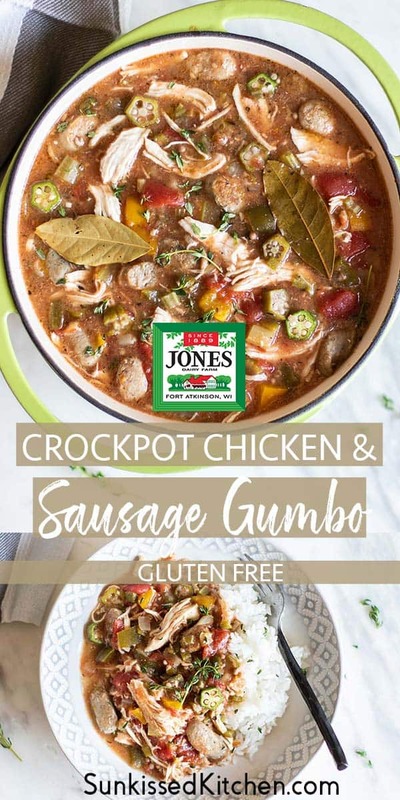 This Crockpot Gumbo post contains affiliate links, meaning if you make a purchase, I receive part of the sale as a commission. This helps me continue to bring you lots of fresh and inspired recipes! I love finding new recipes for my crockpot and this one looks hearty and delicious! Exactly :) Glad you love it also! My family loved it! Such a comforting meal! This gumbo looks so flavourful and delicious! Definitely need to give this a go in the crockpot. Crockpot recipes are the best! I have yet to join the instant pot bandwagon yet because I just love my crockpot so much! This gumbo looks absolutely perfect! So much flavor! A delicious, hearty meal the whole family can enjoy! And I love that the sausages are sugar-free! I am the same way! I work from home so the need for an Instant Pot is just not there! This recipe is just perfect! It's so easy and has so much flavor! Will be making it again and again! Absolutely scrumptious dish! I love Jones Farms sausages. They frequent at our breakfast table, but never in gumbo. Going to change that!